During Wednesday’s proceedings, Clinton clarified the kind of strategy that will be pursued in Central America. “We know from the work that the United States has supported in Colombia and now in Mexico that good leadership, proactive investments, and committed partnerships can turn the tide,” she said.1That the northern triangle of Central America, comprising Guatemala, Honduras and El Salvador is the most dangerous area in the world that’s not a war zone has become an oft-cited refrain as mainstream media outlets begin to beat the drums of war. By all indications, the U.S. led solution to this difficult situation is a simple one: bring open war back to Central America. 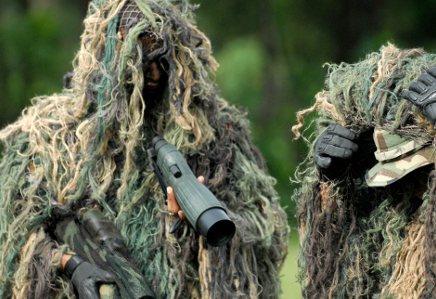 Meanwhile, just across the border in El Salvador, a group of elite army commandos from throughout the hemisphere practiced sniper exercises, while their superiors swapped counter-terrorism strategies during military training competitions sponsored by U.S. Southern Command. The week-long event, known as Fuerzas Comando, is now in its eighth year. None of this comes as a surprise to Ba Tiul, who lives in Alta Verapaz, a region declared under state of emergency last December because of the presence of Los Zetas, a Mexican drug trafficking organization. “What happened during and after the state of emergency here was this: the assassination of Indigenous people in Izabal, evictions in the Polochic Valley, control and threats against community leaders and social organizations, and now they’re trying to displace entire communities, the communities that are in strong resistance to corporations building electrical transmission lines,” he said. “From Alta Verapaz, we understand that this meeting about security has two objectives: to limit the presence of narcotraffickers and organized crime, and to combat grassroots movements that are defending their territories, which are highly prized in today’s neoliberal [system],” Ba Tiul told Upside Down World. The conference was organized by the Central American Integration System (SICA), an organization which is comprised of the seven countries of Central America (including Panamá) and the Dominican Republic, as well as a host of regional and international observer states. Clinton indicated Wednesday that the U.S. government is now seeking observer status with SICA.